I’m just back from the 2013 conference of the New Zealand Plant Conservation Network, where I presented a talk about weedy native plants. The programme of talks included updates on the conservation status of New Zealand’s plants, and the new system being implemented by the Department of Conservation to prioritise management of ecosystems and species. Another talk detailed the significance of the Denniston area for New Zealand’s liverworts. There were several inspiring accounts of hands-on intervention successfully stabilising threatened native plant populations or even bringing about their recovery. One example involved using lawnmowers and herbicides at a high altitude site to control aggressive weeds! Others reported their investigations of the ecology and/or relationships of New Zealand plants. Videos of most of the talks. 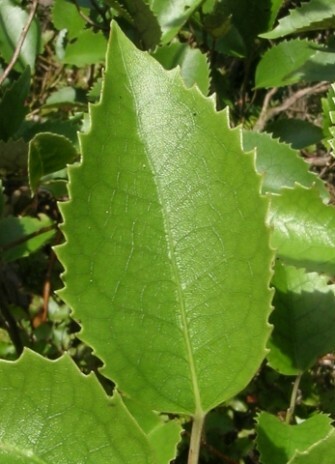 Hoheria populnea (houhere, lacebark) is native to the northern North Island. But after being cultivated more widely, it has spread to the wild in many parts of central and southern New Zealand, and has become a problem weed in several places. Photo Leon Perrie. © Leon Perrie. I was invited to give a keynote address in the symposium on ‘weedy natives’. My focus was on native plants growing outside their natural range within New Zealand. Many New Zealand native plants occurred in only part of the country. Humans have now moved some of these further afield, and some of these native plants are flourishing in parts of New Zealand where they did not occur naturally. 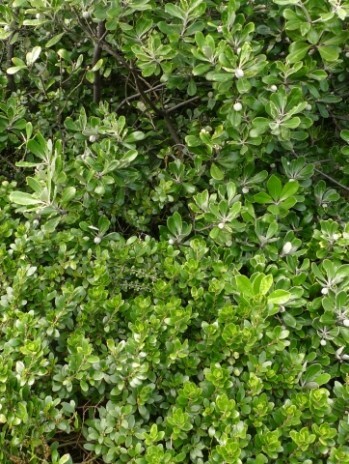 In some cases, non-local native plants are threatening locally-native species. Communities and land managers have decisions to make about how to deal with the spread of non-local native plants. I dared suggest that, in the Wellington context as an example, non-local native plants like karo and (northern) houhere (and perhaps karaka, where outside sites of cultural significance) might be viewed in the same light as exotic (not native to New Zealand) ecological weeds such as pink ragwort, boneseed, brush wattle, and Darwin’s barberry; and that they should be managed accordingly. I finished by suggesting that anyone can help by learning what plants are locally-native to their region, and then observing and reporting non-local plants ‘behaving badly’. We also might take more care with what we plant. Non-local native plants make for fantastically interesting gardens; I have lots in my own garden. But we might forgo those species whose weediness has already been demonstrated.